Central Intelligence Agency Digs In, Refuses to Repeal Damaging Mandatory Declassification Review Regulations. Department of Justice Defends. White House, Congress Silent. The CIA has responded to a letter signed by 36 groups requesting that the it withdraw new MDR fee regulations that allow it to charge up to $72 per hour to search for documents –even if none are found. The response from the CIA’s Information Management Services: Talk to our lawyers, not us. 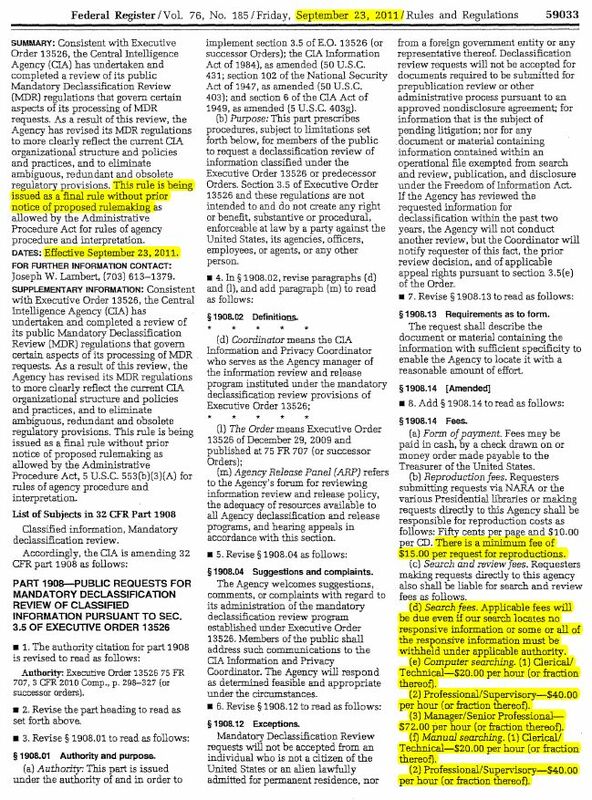 Last September, the CIA quietly (and illegally) slipped regulations into the federal register that allowed it to change its Mandatory Declassification Review fee structure. The Agency now charges up to $72 per hour of search and review –even if no documents are found or released. It also now requires that requesters pay a whopping 50¢ per page released, at a minimum of $15 dollars per request. Requesters must agree to pay all the before the CIA will even begin working on their MDR request. The CIA is attempting to “price out” requesters because it hopes to prevent requesters from appealing its overzealous classification decisions to the quasi-independent Interagency Security Classification Appeals Panel (ISCAP), often referred to as “the secrecy court of last resort.” ISCAP fully or partially overturns more than 65 percent of classification decisions, government-wide. Because the President’s Executive Order on Classification requires the CIA to defer to ISCAP’s decisions, the Agency is attempting to make it too expensive for requesters to take their requests there. For more background, and to read the letter we sent the Agency, see here. "A new era of open government?" So why is the CIA using tax dollars and Department of Justice resources to fight the repeal of this regulation to the bitter end in court, rather than proactively rolling it back and essentially “mooting” one count of NSC’s case? I think there are two reasons. Last year, the CIA fought tooth and nail to avoid being forced to release the oldest classified documents in the US government. These were World War One-era instructions on how to concoct invisible ink and open sealed letters covertly, partially written in French. (Not even the CIA’s own recipe!!) What’s more, while the CIA (and DOJ) wasted money and resources arguing in court and to NARA that these documents had to remain classified to protect national security, the information was easily available on google scholar. When the Agency was finally forced to declassify these documents, it misled the public by announcing that it had chosen to do so out of the kindness of its heart –rather than due to an MDR request. There are many, many more examples of CIA efforts to avoid accountability. The second reason that the CIA is refusing to repeal its openness-stomping regulations is that no one is forcing it to. 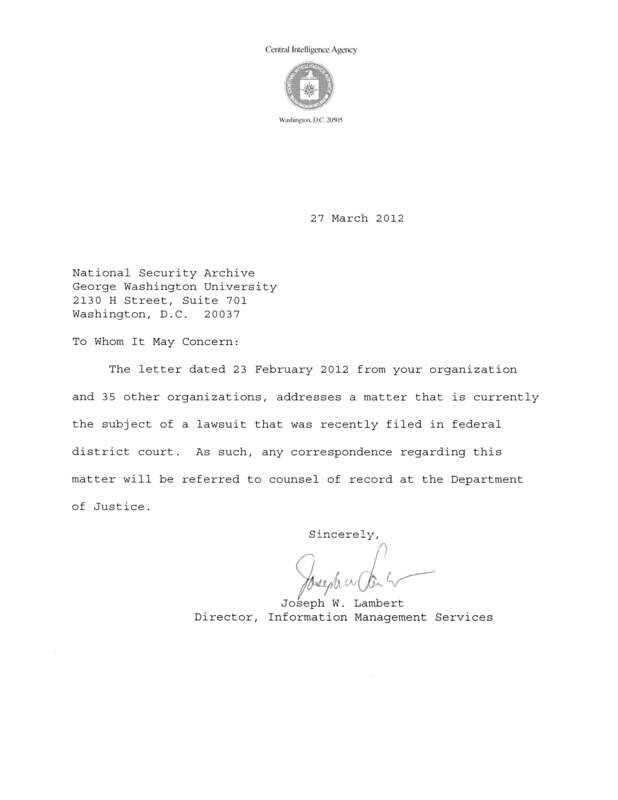 In 2009, Attorney General Eric Holder issued a government-wide memorandum promising that the Department of Justice would no longer defend FOIA cases that would not produce actual harm or were not prohibited by law. The exact opposite has occurred. A study by the Transactional Access Clearinghouse at Saracuse University, shows that there has not been a single FOIA case that the DOJ has refused to defend. While Holder’s DOJ continues to provide agencies with defense for these specific and broad attacks on the Right to Know, the CIA will continue to hide behind Justice Department lawyers and refuse to participate in President Obama’s New Era of Open Government. The administration must also get involved. This week, Special Assistant to the President Samantha Power traveled to Brasilia, Brazil to represent the United States at the Open Government Partnership, a coalition of 55 countries –spurred by President Obama’s 2010 UN address— that have pledged to take concrete steps to become more open. The US delegation touted American openness gains and pledges, including “a multi-agency effort [that] will work to declassify historically valuable classified records.” But is Power (and the White House OpenGov staff) even aware of the CIA’s backsliding at home? If so, why haven’t they done anything to stop it? By doing nothing they are tacitly approving the Agency’s “covert attack” on declassification and serving as a poor example to the other 54 countries in the OGP. The Congressional Oversight and Judiciary committees, who have done a great deal to improve the implementation of the Freedom of Information Act, have also been silent on the CIA’s emasculation of MDR. Advocates for access to information won’t wait for a judge to declare the CIA’s actions illegal. We will continue to work to bring the Agency’s untransparent actions to the attention of the Obama administration and Congress. The CIA has shown that it is unwilling to repeal this damaging regulation on its own accord. Will it be forced to?